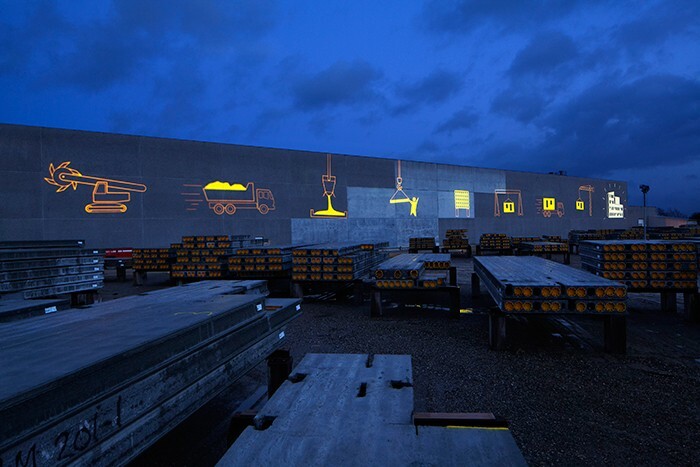 Sitting off the main highway in the Danish town of Losning, innovative concrete solutions provider Boligbeton decided to take advantage of the 30,000 vehicles driving past its facility on a daily basis. An opportunity to refresh its image by using free advertising space presented a more positive company image than the mundane concrete yard. Design firm Pluskontoret Arkitekter (PA) presented a lighting solution featuring 10 Harman Martin Exterior 400 Image Projectors to tell the detailed story of the concrete process. A number of thoughts were considered to improve the yard’s aesthetics, but the proposal to illuminate the 140 x 11-meter façade was the winning idea. 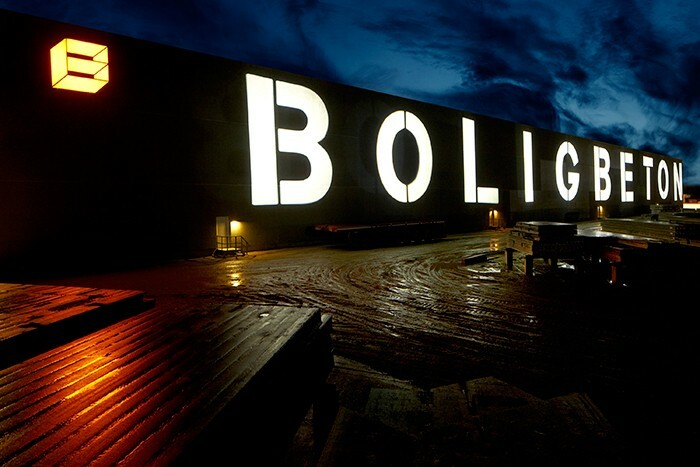 A unique and fun way to tell Boligbeton’s production story, from the open pit and transportation to the end product, would provide a stunning, yet simple solution. Architect Daniel Olsen of PA understood a dynamic illumination scheme would be pleasing to passers-by and those working in the yard. The Exterior 400’s are mounted across 4-metre-tall masts, 36 metres from the façade. Four fixtures project straight onto the wall and six project the distortion calculation graphics to compensate for angled projection. At approximately 6.5 seconds per drive-by, it takes several passes to read the entire 10-story picture. According to PA partner and architect Suna Cenholt, the projectors are installed in a very aggressive environment, exposed to rain, high winds and dust. "We tested several products but the Exterior 400 Image Projector made ? ?the difference. It was important for us to find a durable product that does not require any special maintenance. In addition, the LED technology in the Exterior 400 IP saves on power, which is also of great importance." The lighting system is both dynamic and flexible and allows the company to project a different expression using new graphics and new story if they wish. 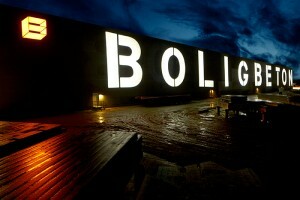 In addition to the Boligbeton story graphics, the fixtures can also spell out ‘Boligbeton’ in text across the façade. The system s controlled via the PC-based Martin M-PC control package with touchscreen technology. "The outcome has transformed the yard and drivers’ experience of Boligbeton dramatically – we are very pleased with the result," says Linette Helbo Jensen, product manager at Boligbeton. "The illumination has received a lot of positive feedback and provides an entertaining experience for the many drivers along the highway every day."